Here we are at the big 60. 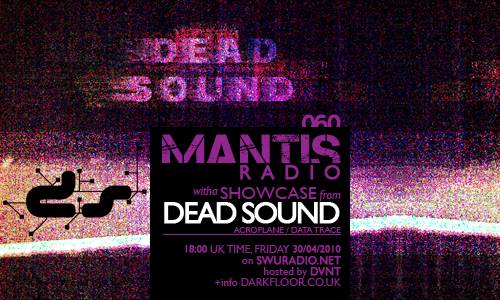 Kicking it out on the Mantis Radio showcase this week we proudly present the broken techno of Dead Sound. Paul Carroll is the man behind Dead Sound – a project involving underground techno/electro/dubstep and broken beat techno which he has been working on for the past year after putting his earlier alias ‘Digital Filth’ to rest and has quickly gained him support from top and varied artists including Dave Clarke, Surgeon, James Ruskin, Stormfield and Warlock. Paul has been playing out live with his own material at underground club nights around the UK most notably Atomic Jam at The Q Club (Nov 09). Paul has also played in top underground techno clubs in Germany that only the locals and people ‘in the know’ knew about including ‘The Villa’ in Berlin and ‘Tranz Hause’ in Hamburg where his hybrid of techno/electro beat went down a storm. Now concentrating on a new way of playing live using segments of loops from the mass of work produced, usually around 4 loops at a time, in the same vein as Richie Hawtin’s DE9, but all original material. 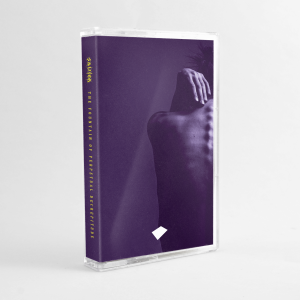 His live sets that are always different, crammed with diverse underground music. Paul’s DJ sets include fast mixing, turntablism. and variety and now using Serato Scratch he’s able to mix his down material in the same vein as DJing, but with the originality of a live set.